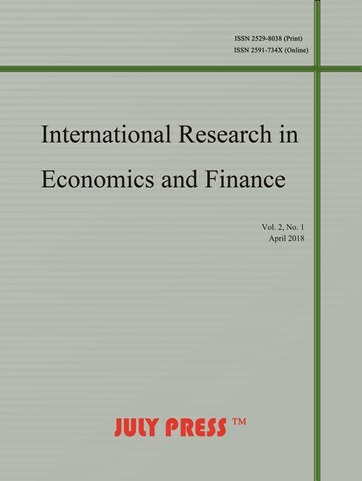 International Research in Economics and Finance (IREF) publishes original research manuscripts in the field of economics and finance. Empirical, theoretical and conceptual articles of significant originality will be considered. IREF adopts a double-blind peer-review policy, contributed by international reviewers. The journal is published in both printed and online versions. Online publications are free to access and download. The aims of the journal are to publish high quality manuscripts that are of international significance in terms of findings. The scopes of the journal include, but are not limited to: accounting, banking, capital markets, economics, finance, insurance, investment, risk management, stock exchange and so on. The journal accepts submissions both online and via e-mail (iref@julypress.com). International Research in Economics and Finance (IREF) is inviting submission of papers for publication in the forthcoming issue of June, 2019. A length between 3,000-10,000 words is preferred. If you are interested in submitting a paper to this journal, please review the Author Guidelines to see how to submit a paper online. Due to an unfavorable US dollar exchange rate and increasing operation costs, the publication fee of International Research in Economics and Finance will be adjusted from $200.00 USD to $300.00 USD per article, effective January 1, 2019. For manuscripts submitted before January 1, 2019 but unpaid before February 28, 2019, the new rate will apply.